The eMIMOx8 module and firmware for advanced Software Define Radio (SDR) applications provide the only solution in the market that is production-ready to support high-performance, ultra-wide bandwidth enhanced-MIMO in a highly integrated form factor with standards-compliant interface. Our patent-pending architecture and algorithms enable us to support superior 5G MIMO performance from 4T4R or 8T8R for a 5G small cell using a single eMIMOx8 to 64T64R and 128T128R for a 5G macro cell using multiple eMIMOx8. Our eMIMOx8 module and DSP solutions will enable our customers to build 5G MIMO products in both sub 6GHz and millimeter wave bands. 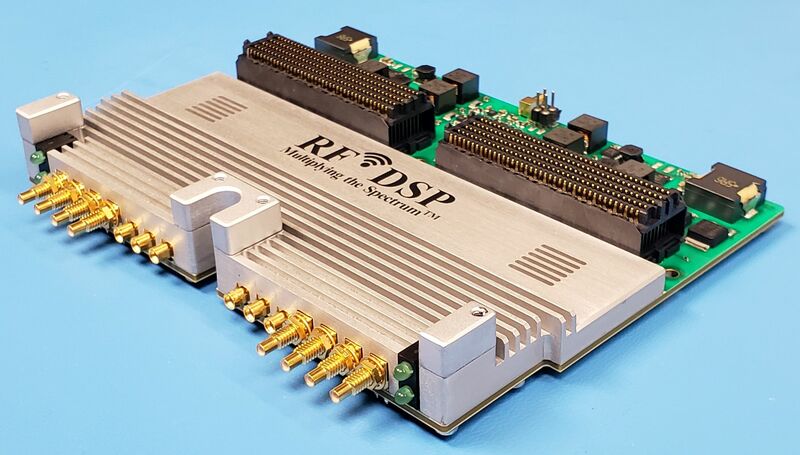 For fast development and commercial deployment, RF DSP provides an extensive Platform Development Kit (PDK) including FPGA reference design with JESD204B, driver that supports the four Analog Devices ADRV9009 transceivers in the module, clock sync, SPI control, and PC software for configuration/control/status monitoring, signal generation and signal recording, analysis in MATLAB development environment, and Linux scripts.